The passing of Andy Griffith last week prompted an outpouring of love and respect for the man and his life’s work in movies, television, and even gospel music. Yet it was his role as Sheriff Andy Taylor in The Andy Griffith Show (TAGS), which received the greatest response from media writers and fans alike. And how could it not? Andy Taylor was such an iconic television character it was as if Taylor and Griffith were one. Even if Griffith disagreed with that assessment, which he did on several occasions, it is what fans of the show believe. Fans also want to believe that Griffith’s hometown of Mt. Airy, North Carolina, was the setting for the show. Certainly, there are numerous references to Mt. Airy and other towns in North Carolina. Yet whether it was or wasn’t doesn’t matter much, because diehard fans of TAGS believe it to be true. Mayberry is Mt. Airy and Mt. Airy is Mayberry. A radio talk show host recently asked whether the show’s portrayal of the region was realistic or accurate. My response is that in some ways this question does not matter. Television is meant to entertain people, which TAGS did very successfully. But if we are going to go there, we can think about this from two different angles: one is Griffith’s, the other is about the reality that existed in Mt. Airy, upon which it is believed the show is based. Most people associated with TAGS acknowledge that the show reflected Andy Griffith’s vision, which he has repeatedly said was to tell universal stories about goodness that reflected the values he grew up with. So, who are we to argue that what he presented was not an accurate representation of his own experience? 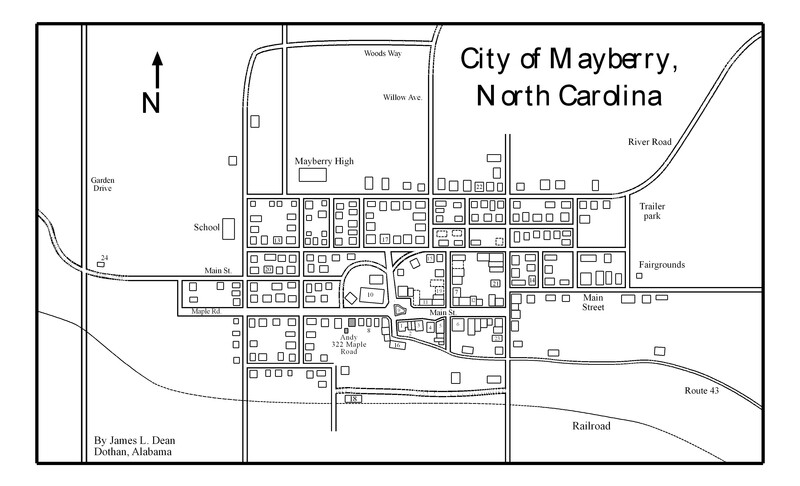 Then there is Mayberry, the setting for the show. Was it realistic in presenting a small southern town like Mt. Airy? Here, one could argue both for and against realism. On the one hand, it appears there are no African Americans living in Mayberry. Oprah Winfrey, a self-confessed fan of the show, once asked “Where are the black people?” Historically, Mt. Airy has had a black population, albeit a small one. Therefore, one could argue against realism. Yet it could be that Andy Griffith chose to write about the nostalgic South of his youth, in which he grew up in a primarily white community. If so, then one could say the show was realistic. What we might all agree on is that Mayberry did not represent the South of the 1960s. 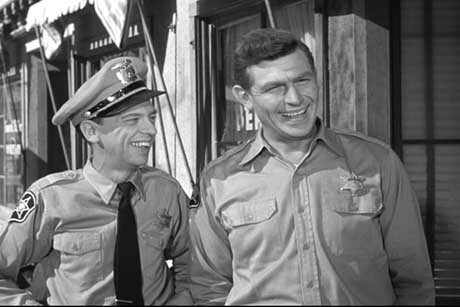 Throughout its run on television, The Andy Griffith Show regularly ranked among the top ten most watched shows. It offered a nostalgic portrayal of the region—one that countered the negative images of the region present in the civil rights coverage also being watched by millions on the evening news. The sit-in movement began in Greensboro, North Carolina, just down the road from Mt. Airy. And in Mayberry, the worst thing to happen might be a prisoner on the loose from the state penitentiary who, by the end of the show, will be caught by Andy Taylor. The point is that it was Andy Griffith’s intention to entertain people through the stories and characters who lived in Mayberry—not make a political statement about civil rights. Moreover, many of its fans, like Oprah Winfrey, are African American. The fact is, the show has universal appeal. More importantly, especially given today’s reality television programs (a large number of which are set in the South), The Andy Griffith Show didn’t trade in negative stereotypes about the region or southerners. When there were hillbillies on the show, like the Darlings or Ernest T. Bass, they were fully developed characters with endearing, and likeable qualities. Female characters, particularly Andy’s girlfriends Ellie Walker and, later, Helen Crump were educated professional women who had their own homes. In some episodes, their dialogue suggests that they were well aware of the feminist movement of their day. Television coverage of Griffith’s passing inevitably included interviews with residents of Mt. Airy, still a small southern town. Interestingly, one woman interviewed by a local station here in Charlotte was from New Jersey. She told the reporter that she loved TAGS so much that after attending Mayberry Days—the town’s annual celebration of the show—she moved to Mt. Airy so she could live in a place where people still maintained good values and looked after one another. What this woman sought via her love of The Andy Griffith Show was to return to a different time and place. It is a nostalgic craving for a bygone America, but as it turns out, it is in the South of Mayberry where she thinks it still exists. Steve Welker has only lived in Mount Airy for about 2 years,so his history of the area is slhgitly lacking. Our heads??? In Mr. Welkers role as a professional journalist(editor of our local paper) makes him quick to pontificate about his knowledge of all things Mayberry,some of which are incomplete.In Mr.Griffiths trip here 2 years ago, he made a speech which noted that Mount Airy was indeed his inspiration for much of the mythical Mayberry,and noted names of residents and places used in the show.The people who come to Mayberry Days are wonderful.They all have a bright cheerful demeanor and I for one are proud to welcome them to my home town. My wife and I have breakfast each year every Sunday moning of the last day of Mayberry Days with a couple from Harland Kentucky and have made great friends with them. They have been to Mayberry Days 14 years straight.The area must have some appeal,after all, Mayberry Days draws 30,000 people a day and the Andy Griffith Museum/Visitors center attracts around 80,000 signed in guests a year.If you came to Mayberry Days 1997-2004,you would have seen me driving the 1950 Studebaker pictured above in the Saturday morning Mayberry Days parade.This little town is a great place to live. I’m actually from Mount Airy and the sad truth is lots of pepole come thinking its the real thing. I guess its an ok place but growing up there, there’s not much to do except super Wal-mart..woo freaking hoo.Well, I know this probably doesn’t make much of a difference but Andy Griffith actually lives in Nags Head. He doesn’t come back much, I think pepole had to beg him to come back so they could dedicate Hwy 52 to him and it’s now renamed the Andy Griffith Parkway. There is another reason that he doesn’t come back but I won’t go into that. The sad thing is, there are actually other historic attractions. There are a number of Victorian houses if you’re into that sort of thing that you can tour. It’s also where Eng and Chang Bunker also raised family. Also it’s the home of some fiddlers such as Benton Flippen who is in the Local Regional Museum in Raleigh, also turns out to be one of my relatives. Mount Airy is the small town, where everyone knows everyone and you end up being related to everyone.